This was my third trip down the Colorado River, my second trip with Steve Wiley, who is an excellent guide and boatman. 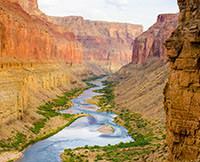 All of his crew are very knowlegable of all aspects of the Grand Canyon including the geology, history, and weather. I expect my fourth trip in two years. A great time was had by all.